Christmas came early, and if bringing our trailer home is any indication as to how this project will go, it will be an adventure! 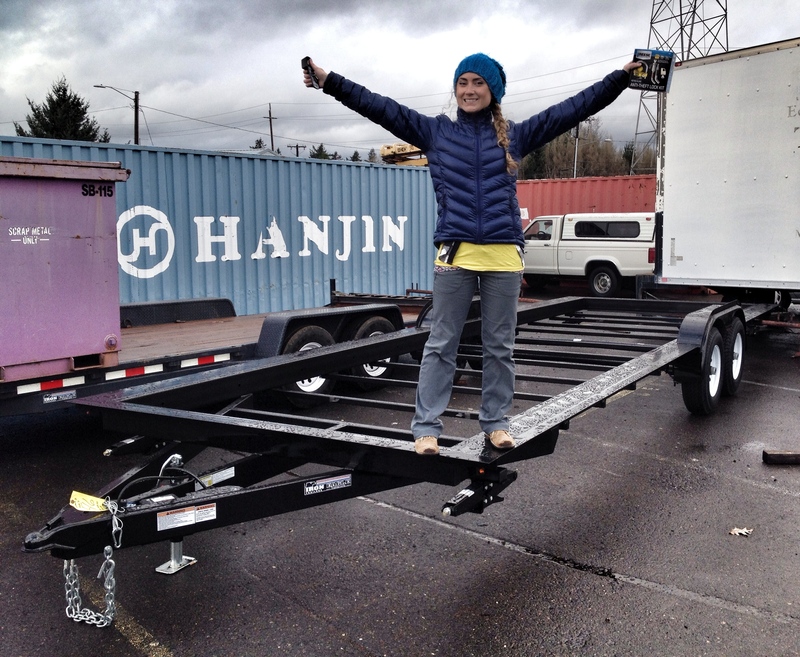 While it only took a telephone, a credit card and 10 minutes of our time to purchase our custom manufactured trailer, getting it to Yakima, WA from Portland, OR on the west side of the Cascade mountain range was sure to take a little more effort. The trailer was set to be complete by November 26, which is when Samantha and I planned to travel to Portland next to spend thanksgiving with her sister, Jessica. As Luck would have it, our friend Brad was also going to be heading in that direction to spend the holiday with his family and while his aging Toyota 4runner would never be able to pull our fully built tiny home, we were optimistic about its chances of getting the stripped down trailer home. Samantha, Jessica and I enjoyed copious amounts of food, libations, football and napping making our first Thanksgiving on the west coast (we visited home for last years feast) a success and it was time to start thinking Tiny. A quick morning walk out of Jessica’s front door into the bustling Mississippi St. neighborhood allowed us to grab one of the best food truck breakfast wraps (The Big Egg, adjacent to Prost) and the obligatory coffee before stepping foot into Portland’s premier re-use store. The Rebuilding Center is a conglomeration of multiple warehouses, packed with well organized reclaimed, donated and salvaged materials becoming a pickers paradise where the difference between treasure and trash is in the eye of the beholder and where a bit of Portland history lurks in the often rugged and used materials, fixtures and trinkets salvaged from the local neighborhoods through labor intensive deconstruction services with hopes of providing a second life to these items rather than occupying a landfill. We spent an hour getting lost and gaining inspiration in the rows of sinks, tubs, lights, trim, lumber, tile, windows and doors and wishing we knew a little more about exactly what we need. A visit to the re-building center will certainly become a part of every visit to see Jessica, as our list of needed items grows. We then met Brad at Iron Eagle Trailers just outside Portland and the first glimpse of our trailer was a surprise to all of us. As a far as a home footprint, it was small, as far as trailers go, it was pretty big, and as far as Brad, the person who had to tow it home, was concerned it was way bigger than he had anticipated. A 3 day trip permit cost us $25.00 and allowed us to transport the trailer from one location to another without having to pay for plates and registration seeing as it is going to sit stationary for a year during the building process. After a last minute hook up tutorial and lug nut check from Rob, we were on our way, heading over the Columbia River into Washington. We stopped at a relatives residence briefly to pick up a few pieces of furniture that we carefully tarped and tied down to the trailer with intentions of protecting them from the ominous looking clouds and before we could get back on the road the hail started falling. Within minutes of our departure from Vancouver, WA the wind had infiltrated every susceptible crack in our tarp job, ripped them open and completely exposed the contents of the trailer to the oncoming rain, sleet, and snow that we encountered on the way home. Because we had to stop in Vancouver, Washington and our trip permit was technically only good for Washington roads we took the slightly slower but arguably more scenic Rt. 14 East through the Columbia River gorge. As we carefully navigated our way through the winding roads and light rain we were treated to unsurpassed views across the river at the rugged frosty white peaks and deep shadowed valleys carved by creeks that terminate in tall waterfalls as the Oregon border drops dramatically into the Columbia River. Greens faded to browns and the landscape began to mellow as we left the Cascade Range behind and approached the large swath of wind turbines that signaled our upcoming departure from the gorge. As we crested the ridge and left the river behind, we were greeted by Mt. Adams standing prominently above the valley floor with a fresh coat of snow. Snow covered license plates of oncoming cars warned of a potentially hazardous crossing of Satus Pass, but a mere 15 minutes of flurries gave way to blue skies and a sunset as we drove the final stretch of the journey and arrived in Yakima after dark. We backed the trailer through the large barn doors and unhooked it in its resting place for the next few months. Oh Yea, I guess we are late to announce that we have a place to build and are so appreciative of Harris Farms who have offered one of their nearby spacious barns for us to begin building in over the winter! And we can’t thank Brad enough for offering up his vehicle and his driving skills to successfully bring our foundation to Yakima. It will still be a week or so before we begin building but keep an eye out for a post regarding the trailer we purchased and why it is so perfect for our project. Hi Brian and Samantha! !-I was so excited to see other tiny house person in my “backyard”. I live about 40 miles away (Mabton), I hope to start a tiny cabin/house next spring on my 17 acres. I would like to volunteer my free labor if you could use any help! I am a school bus driver by day, and dont have construction experience, but I can swing a hammer and would LOVE to help in any way I can…and Harris Farms, in Selah? Is that Ben Harris? I know him from working at Yakima Meadows years ago. Hope to hear from you! Thank you for your generous offer, we will keep you updated on the progress and any potential work party/barbeque gatherings we brew up! Our contact has been through Craig Harris who lives here in Yakima but there may be some connection through the deep roots planted in this valley.